Back by popular demand, The Smokin Ham Band will perform at the Mahan Building on Feb. 16 for “A Valentine’s Dance.” Sponsors for the event (L to R) are: front row: Shane McMahon with State farm insurance; Jenny Coe, Fayette County Agricultural Society Director; and Doug Marine, Fayette County Agricultural Society Director. Second row: Tony Penwell with Tony’s Welding and Fabrication; Dennis Garringer, with Nutrien Ag Solutions; Bruce Collins, with Collins Septic; and Chris Cottrill with Cottrill Seed Solutions. Other sponsors not pictured are Fox Jewelers, Barkers Towing, 3-C Cab, and Amore’ Pizza. The Fayette County Agricultural Society will present “A Valentine’s Dance” next month at the Mahan Building. The Fayette County Fairgrounds will once again host the Smokin’ Ham Band (SHB), back by popular demand. 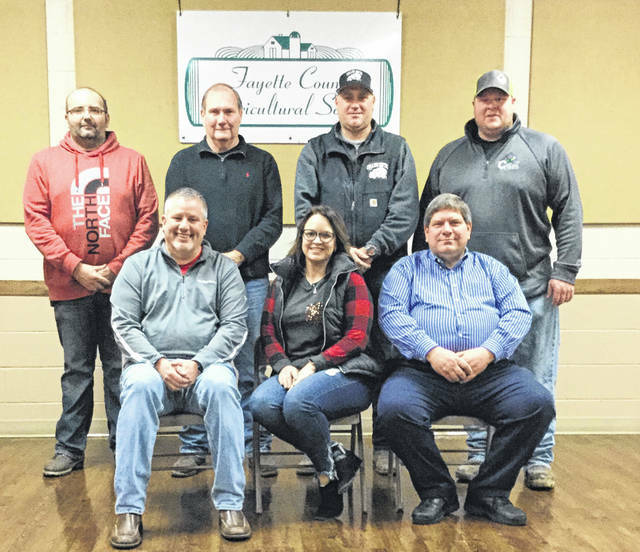 The proceeds from the dance — which will be held on Saturday, Feb. 16 — will benefit the Fayette County Ag Society. Based out of London, SHB consists of seven accomplished musicians with a true love for country music and folks everywhere who enjoy a great live performance. Their mixture of authentic instruments for the genre and pure vocal talent, combined with the discipline of playing together for many years, ensures that patrons get a Nashville-quality performance each and every time with the SHB. School buddies Rod Mouser and Keith Howard formed The Smokin’ Ham Band in 1987 and have never missed a show or canceled a scheduled event. The band they have assembled today represents Ohio’s finest musicians in both character of person and musical ability, according to their website. Band members include Randall Morris on drums, Keith Howard on bass guitar, Rod Mouser, lead vocalist, on acoustic guitar, Dan McKinney, on lead guitar, Darwin (Dr. Wong) Conley, vocalist and on guitar, Brian Myers on the fiddle and Phil Perry on pedal steel guitar. Doors open at 6 a.m. and the band will take the stage from 7:30 to 11 p.m. Tickets are $10 each in advance or at the door. Residents 21 and up may enter and enjoy the dancing throughout the night with a full cash bar and food available for patrons. Sponsors for the event include State Farm Insurance, Tony’s Welding and Fabrication, Nutrien Ag Solutions, Collins Septic, Cottrill Seed Solutions, Fox Jewelers, Barkers Towing 3-C Cab and Amore’ Pizza. For additional information or questions, or to purchase tickets in advance, call (740) 335-5856.
https://www.recordherald.com/wp-content/uploads/sites/27/2019/01/web1_IMG_0167-fair-board-pic2.jpgBack by popular demand, The Smokin Ham Band will perform at the Mahan Building on Feb. 16 for “A Valentine’s Dance.” Sponsors for the event (L to R) are: front row: Shane McMahon with State farm insurance; Jenny Coe, Fayette County Agricultural Society Director; and Doug Marine, Fayette County Agricultural Society Director. Second row: Tony Penwell with Tony’s Welding and Fabrication; Dennis Garringer, with Nutrien Ag Solutions; Bruce Collins, with Collins Septic; and Chris Cottrill with Cottrill Seed Solutions. Other sponsors not pictured are Fox Jewelers, Barkers Towing, 3-C Cab, and Amore’ Pizza.